Our pets are part of our family, and losing one certainly isn't easy to overcome. But if there is a way to properly say goodbye to them, then it is by making them a pet memorial that will remind us of the great moments we shared together. There are many different models that can be found on the internet, but making one by hand and from the heart is also a wonderful idea. Mix the cement in a larger bucket until it becomes like brownie batter. Then, pour it into the plastic mold while paying attention to the amount you pour so that the stone would be as thick as you want it to be. Smooth the surface with a trowel, and leave it to set for about 30 minutes to an hour. You can test whether it is dry enough for writing by making a line on the surface with a wooden stick. If the line holds its shape, then the cement is ready. 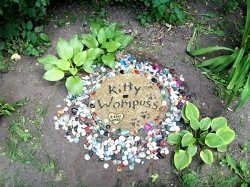 How you'll decorate the pet memorial garden stone is completely up to your imagination. You can use polished river stones, colorful garden stones, glass beads, mosaic pieces, or marbles. You can also place your favorite picture of your lost pet on the stone. If you want to paint on the stone, we suggest using acrylic paints. When you are done decorating, leave your special memorial to dry for about 24 hours. Then protect everything by applying a polyurethane coating, one layer after another, with an hour of pause for drying between the layers. This will save the pet memorial from the ugly bubbles that can appear in the clear coating. Apply five to six coats of polyurethane and leave the garden stone pet memorial to completely dry for about 24 hours before you take it outside in the garden. Once your memorial is carefully placed out in the garden, you could add a few beautiful garden planters or a peaceful outdoor water fountain nearby to give this special spot a tranquil ambiance.